Like all regular cleaning materials, microfiber cloths are simple items. This is exactly why it might come as a surprise that there’s a lot more to microfiber cloths than meets the eye. Microfiber has been around on the market since the 1970’s and since that time it’s developed and improved quite a bit. No longer are these microfiber cloths only good for cleaning your eye glasses or polishing the side view mirrors on your car. Microfiber is the modern way to clean almost anything! One area of cleaning where microfiber is particularly useful, is for cleaning windows and glass. That’s because the properties of these cloths help you get the crisp, clear shine you expect to get from from a freshly cleaned window. Microfiber is a term to refer to any fabric that has strands of less than one denier. Most microfiber materials are made from synthetic fabrics such as polyester and polyamides such as nylon and tragomide. To give some perspective to the thinness of microfibers, a denier is a measurement unit to measure the mass density of fabric fibers. It’s a measurement system that works by measuring the mass of a fiber (in grams) per 9 kilometers (which is approximately 5.6 miles) of its stretched out yarn. Although the density of a specific fiber’s material will also play a role in the denier measurement – thinner fibers will tend to yield a result that’s a lot lighter than that of thicker strands. Also, for a material to qualify as microfiber, its fibers should be thinner than 10 micrometers, meaning the individual fibers in a microfiber cloth are microscopically small. When comparing the results of microfiber to that of other common fibers, it becomes especially apparent just how thin the cloth fibers are. For example, silk fibers – which are very thin – tend to be about one denier. As mentioned, microfiber is always less than that, meaning all microfiber is finer than silk. When compared to a human hair, microfibers are about 100 times thinner. The super thin nature of microfiber strands is exactly what makes it a great material for cleaning cloths. Microfiber is a useful material and is often used to manufacture all sorts of products, not only cleaning materials. However, the benefits on microfiber go hand in hand with effective cleaning. The fact that microfiber strands are so thin is exactly what gives the material such good qualities for cleaning purposes. That’s because the ultra fine fibers have the ability to trap even the finest dust particles. In fact, the fibers in microfiber cloths are so small, they can even trap bacteria and microscopic mold spores. While microfiber cloths aren’t as effective at cleaning away microscopic pathogens as a disinfectants are, microfiber cloths can significantly reduce bacteria in areas you clean – making it highly effective for everyday cleaning. Microfiber also has a great capacity for attracting and trapping moisture between the tiny fibers – making microfiber cloths great for polishing anything, as they don’t leave any water lines behind after wiping. Perhaps the only thing that microfiber cloths aren’t quite as good at cleaning is oil. Oil particles will get trapped between the super thin fibers and is nearly impossible to wash out again – causing the cloth to become permanently soiled in oil. All these factors combined make microfiber cloths the ideal thing for cleaning almost any surface. Because microfiber cloths have great properties for attracting and trapping dirt, the cloths are great to use without cleaning chemicals. A simple spray bottle of water and your cloth is all you need. Water can also be mixed with a mild cleaning agent like vinegar or some form of alcohol like ethanol – both of which are natural and safe for cleaning. This means that using microfiber cloths can greatly reduce the amount of harmful chemicals necessary to clean an area. 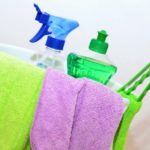 Reducing the need for using harmful cleaning chemicals is good for the environment, human health and saves a lot of money, seeing as strong chemical cleaning agents are often expensive. This adds to the benefits of microfiber cloths, as they’re an environmentally friendly alternative to strong cleaning chemicals and are also highly economical in terms of cost and durability. One of the traditional ways of cleaning windows is using a squeegee soaked with a combination of water and cleaning chemicals wipe the window clean and remove dirt. After that, comes the dreaded crumpled newspaper pieces, which are used to prevent of water stains and lines often left behind after cleaning with a squeegee. Another popular way for cleaning windows, is using paper towels and a bottle of window cleaner. With this method, the window cleaner is sprayed onto the window and immediately wiped away with a paper towel. The benefit of this cleaning method is that it only involves one step, seeing as the paper towel won’t leave behind any marks on the window. However, using this method to clean windows is still inefficient, as it takes a lot of paper towels and window cleaner to clean a relatively small area of window. This is not only costly, but harmful to the environment. Because this inefficiency, using the paper towel method simply isn’t an option when cleaning larger commercial buildings with a lot of windows. As with newspaper pieces, paper towels can start to peel when they become too wet. Both paper towels and newspaper are prone to shed some of their particles while cleaning. Creating lines of dust-like lint particles on clean windows. That’s it! No need for strong cleaning chemicals or anything like that. As an alternative to dampening the cloth before you start cleaning your windows, you can also have a spray bottle with water on hand. 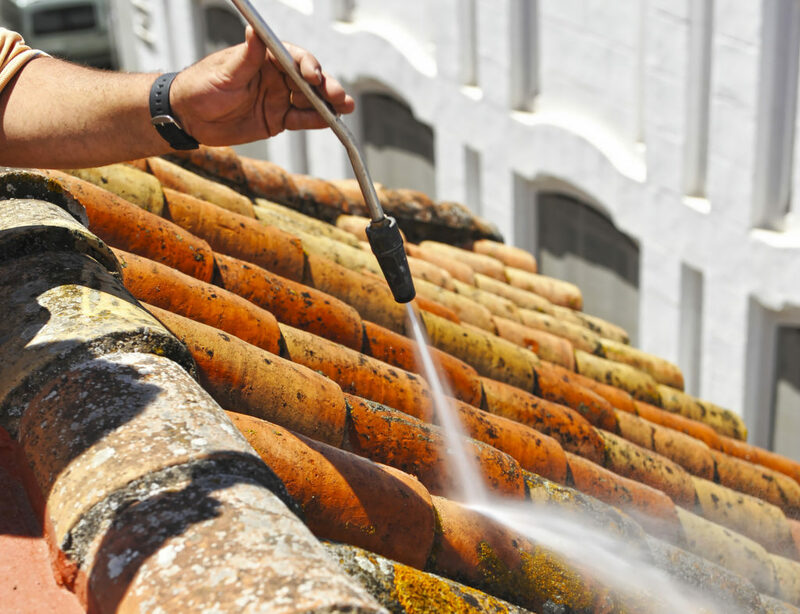 With this method, you’ll spray water onto the window and wipe it away immediately using a dry microfiber cloth. For dirtier windows, a mixture of water with a mild, natural cleaning agent. Vinegar, alcohol or dish washing liquid are great choices to mix with water and spray onto windows. Simply wipe the mixture away with your microfiber cloth the leave windows spotless. For alcohol to mix with water, ethanol is a cost-effective and relatively easy to find option. However, if finding ethanol for cleaning poses a problem, you can even use vodka. The good thing about using alcohol to clean with, is that it’s a natural choice. 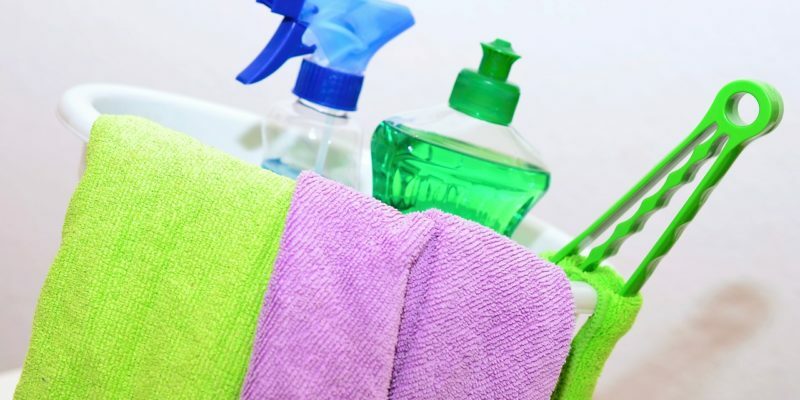 When compared to using harsh synthetic chemicals, alcohol is good at disinfecting and cleaning. Alcohol can also dissolve fats, so it will dissolve a thin layer of fatty deposits that might be present on your window. You can also use normal cleaning agents when cleaning with a microfiber cloth. So long as it doesn’t contain any wax or oily ingredients, which will damage your microfiber cloth. Using a microfiber cloth for cleaning should make things a lot easier. But to get the most out of microfiber cloths, you need to choose the right one for the job. For cleaning windows, it’s best to use an ultra fine, smooth cloth with a flat-weave to get great results. Using a fine cloth will prevent any scratches on delicate glass surfaces and even electronics. It’s also important that any microfiber cloth you use has a dense weave. To check the quality of a microfiber cloth before buying it, simply hold it up to a light. If you see any light shining through the cloth, it’s not a good quality microfiber cloth. Keep looking until you find a cloth that passes the light test. It’s great to know that microfiber is an alternative option for cleaning your windows spotlessly. However, if the thought of cleaning your windows yourself is enough to make you run for the hills, hiring professionals to do the job is a great alternative. 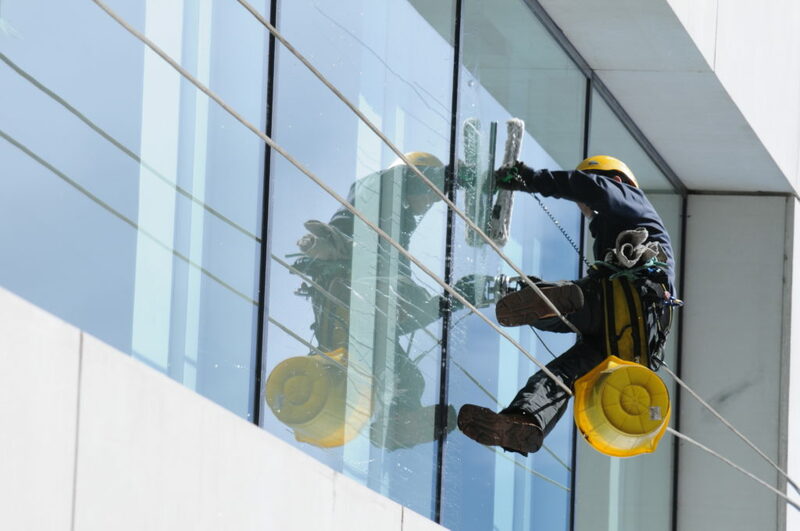 At Miami Affordable Window Cleaning, we specialize in cleaning residential and commercial windows. From homes to high rise buildings, we do it all. Contact us for a free, no-obligation quote.